Alabama Plate Cutting utilizes a 400 amp Plasma Torch on a 12’ x 67’ long table. Plasma works by sending a pressurized gas, such as nitrogen, argon, or oxygen, through a small channel. In the center of this channel, you'll find a negatively charged electrode. When you apply power to the negative electrode, and you touch the tip of the nozzle to the metal, the connection creates a circuit. A powerful spark is generated between the electrode and the metal. As the inert gas passes through the channel, the spark heats the gas until it reaches the fourth state of matter - plasma. This reaction creates a stream of directed plasma, approximately 30,000O F (16,649 C) and moving at 20,000 feet per second (6,096 m/sec) that reduces metal to molten slag. 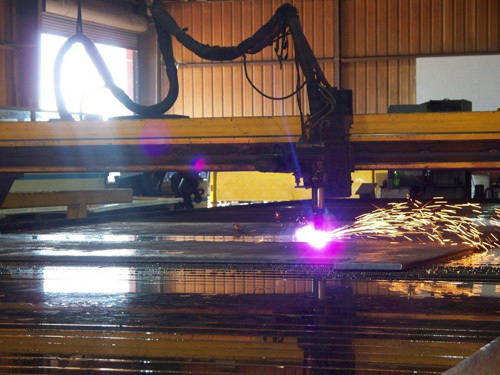 Plasma cutting is not as accurate as laser cutting but the advantage of the plasma cutting process is much faster cutting rates. Copyright 2019 Alabama Plate Cutting Co.